I wasn't blogging back in 2015. Backlogging another race. 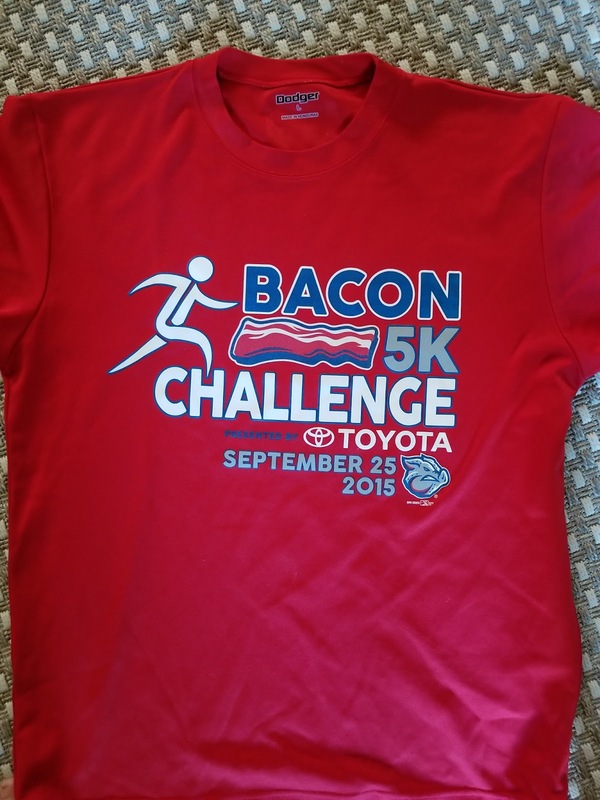 The Bacon 5k Challenge, hosted by the Lehigh Valley Iron Pigs. (minor league baseball team). 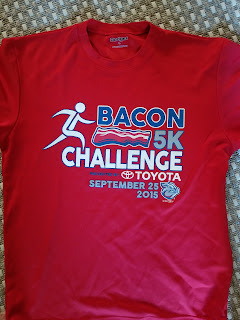 To forewarn you, this is not a normal 5k, it contains a food challenge! Mid 5k, you must eat a half pound of bacon! 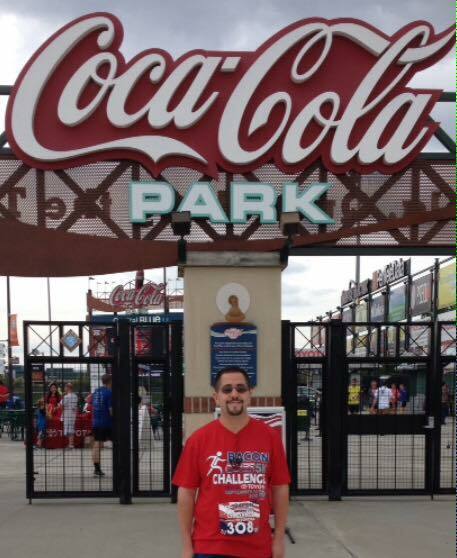 There is a non bacon challenge if you are interested, but this is the Iron Pigs, and they are all about the bacon! Scenery: majority of the race is parking lot. but if you love bacon and baseball, that is fine. 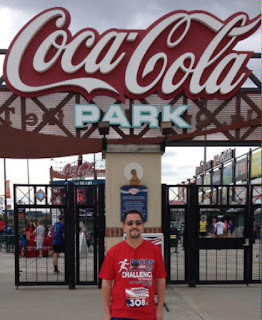 Pre race: able to walk around the stadium. A dj, mascot, vendors, a great baseball and bacon crowd. Even a few runners dressed as bacon. Race: starts fast/flat and then down a steep hill, turn around, and up that steep hill for about 1/4! Zig zag back and forth in the parking lot. Pause midway in front of the stadium. Eat a half pound of bacon! Some crunchy, some a bit fatty, but all delicious. No water to help with the bacon challenge. Hands get greasy, could use napkins. There are a few employees watching to make sure no one cheats on the challenge, you must show your empty container before taking off. Resume the race! Remainder of the race is down and around the parking lot. Cramping up? No, that's just your arteries.. Lol. Down around the backside of the stadium, through the stadium, and around the warning track. Finishes just before home plate. Post race: party overlooking the baseball field with one "free" beer! Stadium is nice, not a bad seat in the house! Swag: Tech tee shirt that has bacon scratch n sniff! bacon mid race, and a "free" beer after! Reflecting back, i would definitely do this again. 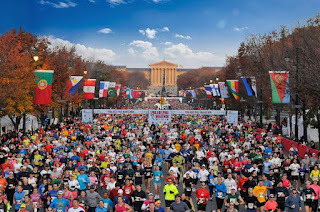 Unfortunately 2016/17 were held the day before the Rock n Roll Philly half. Made the decision to do the half, and don't think it would be wise to do this the day before. Doing some backlogging, all the way back to September 2015! 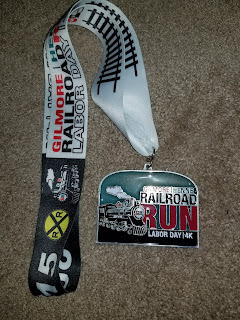 This was my first finisher’s medal! 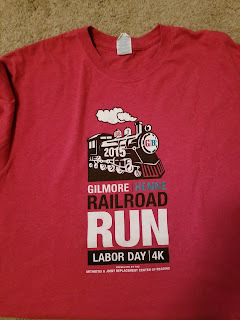 Railroad Run, Labor Day 4k! My first 5k was just a couple weeks before this. 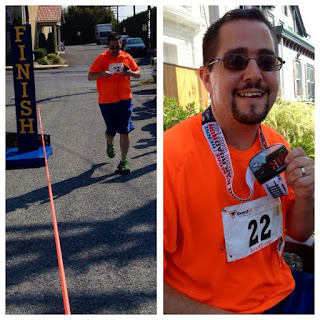 I had been running for a couple years, and my co-worker had been twisting my arm to do a race. Well, signed up for another race a few weeks after this one, and figured while I’m at it I might as well sign up for this one. Elevation/Scenery: course is relatively flat. No noteworthy hills or inclines. The course starts at The Railroad House bar and grill. There’s about a half mile straight away from the starting line to a nearby neighborhood, zig-zag a few blocks through the neighborhood, back on the straight away to return. Aid/water: at least one water station mid course. Water, bananas, and soft pretzel post race. Parking: the restaurant has ample parking for the race. If you arrive last minute the roads may be closed, you may have to walk a few blocks. Expo: you may pick up your bib the day before and grab a drink. Race Management: smooth process throughout, managed efficiently. I would recommend this race. It's for a good cause, it's a good time, you get your money's worth. Small race, approximately 200 people, you may even win a prize. 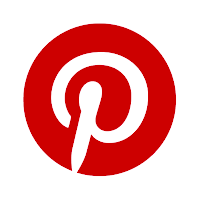 Let’s first go into what you shouldn’t do. The race is held on Labor Day. The day before the race, I attended a college buddy’s annual party. All sorts of summer BBQ food and several beverages were consumed. From there, drove (actually my dd drove, I did not drive) to my dad’s house, who lives close to where the race is held. We went out to dinner, another beverage consumed. Race day: race didn’t start till 10 am, plenty of time for coffee, light, breakfast, and hydration. I was ready to go way before race time. I needed to pick up my packet before the race, and saw the emails regarding street closures. So, of course I got there way too early. During my previous race, I learned the hard way that race speed is different than training speed. It may be/feel fast, but need to pay attention to pacing so you’re not dragging at the end. Did a little better at pacing myself, but was still something to work on. 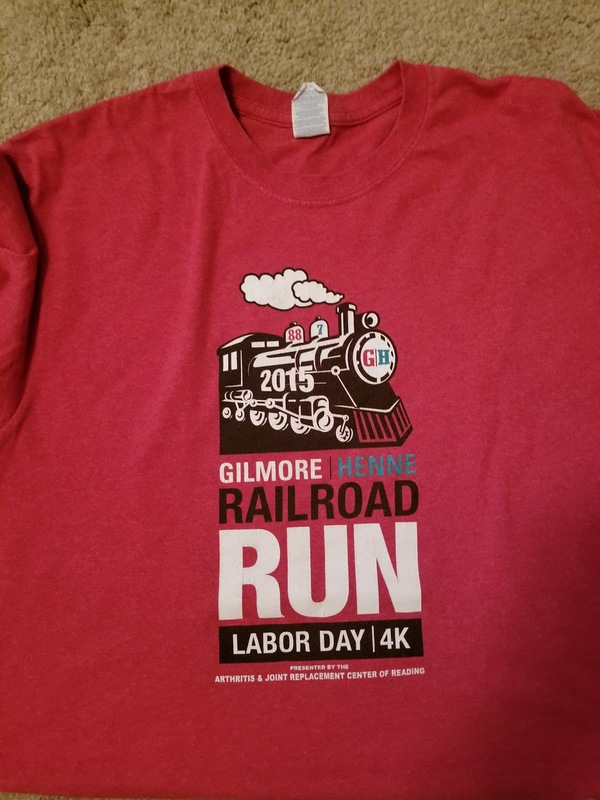 Shirt/Swag: The Tee shirt featuring their Railroad Run train and their G|H logo is very soft and comfy, still holding up after two years. The Railroad Run train and logo is also featured on the medal as well. 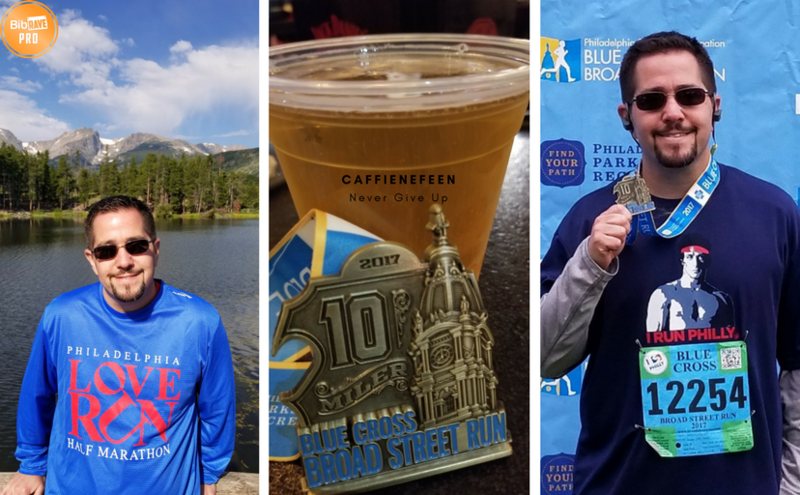 Plus a “free beer” post-race. Good luck to everyone with your training!